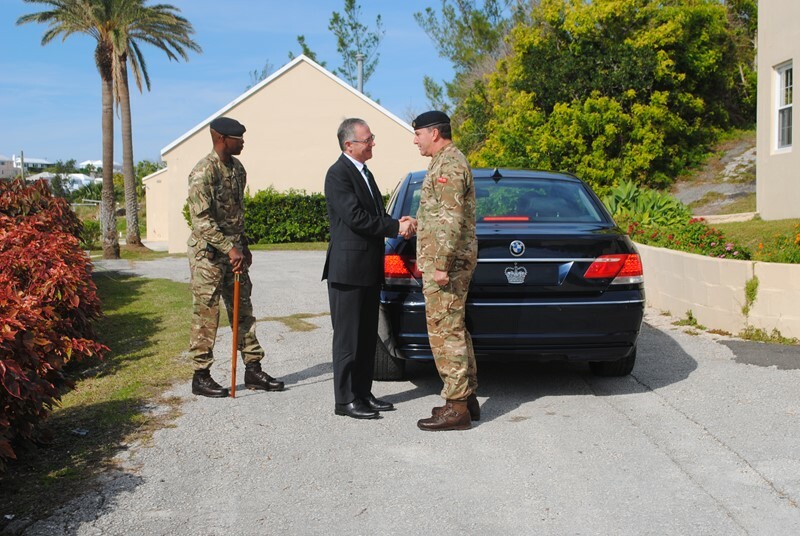 New Governor John Rankin paid his first official visit to the Royal Bermuda Regiment to meet its latest recruits. Mr Rankin toured Warwick Camp, stopped off at classes and chatted to the RBR’s new soldiers as they settled into to a tough two weeks of military life in Recruit Camp. He said, “I’m very pleased to be coming at the time of Recruit Camp and I’m delighted to see so many volunteers have come forward. 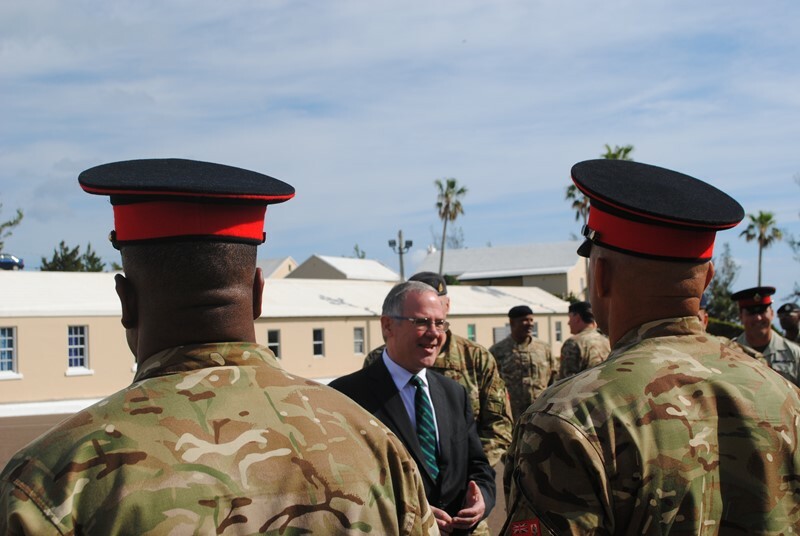 The Regiment has an important role in supporting the safety and security of the island. Governor George Rankin [right] is escorted on a tour of Warwick Camp by Captain Preston Gill, officer in charge of Recruit Camp [left] and other senior member of the Regiment team. 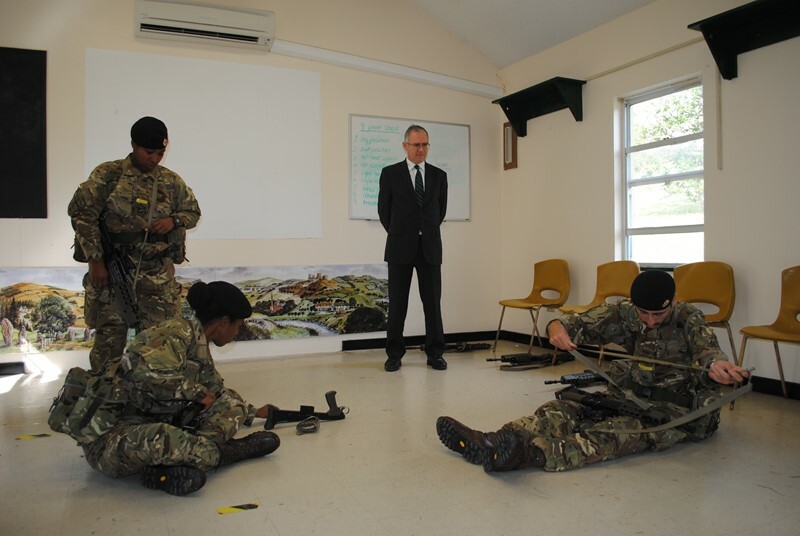 Mr Rankin watched recruits perfect their drill on the parade ground and skill at arms classes where new soldiers worked as teams to break down and reassemble the RBR’s SA-80 rifles, donated two years ago by the British Army. Mr Rankin said his diplomatic career had involved working with the British military in the UK and Iraq, where he visited UK soldiers in war-torn Basra and had seen first-hand how troops cope with challenging environments. He added: “What I’ve been impressed with here is I got a sense of real camaraderie from the members of the Regiment. Soldiers break down and reassemble an SA-80 rifle in relays as Governor John Rankin looks on. “I’m also aware that both through its Junior Leaders programme and bringing in young recruits, the Regiment plays an important role in developing the young people who are the future of Bermuda. Mr Rankin will also attend the recruits’ passing out parade – and lead a Government House team in the traditional marksmanship test, the falling plates competition. 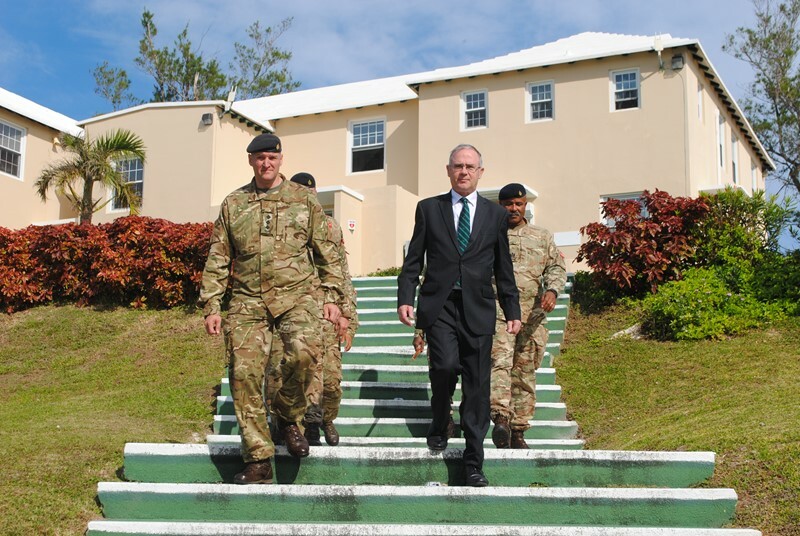 Captain Preston Gill, officer in charge of Recruit Camp, said: “Both the Governor and the Premier, who was here on Monday, were very enthusiastic about the spirit of our soldiers. 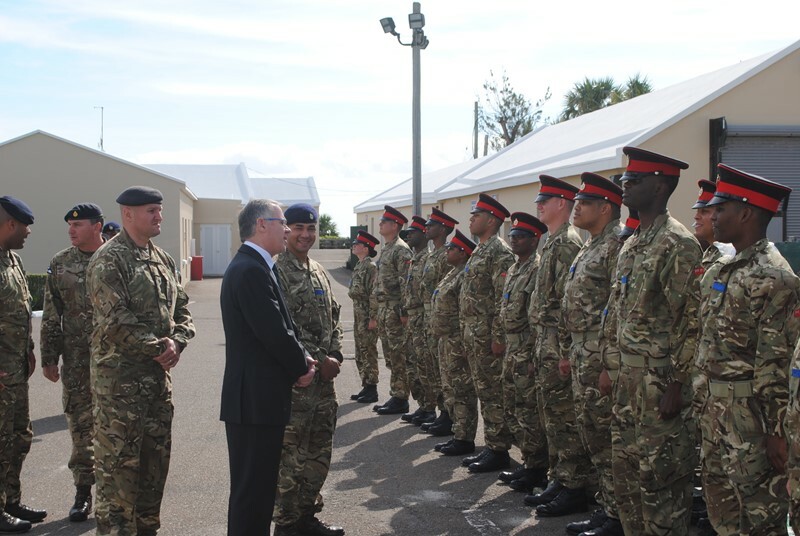 Lieutenant Colonel David Curley, Commanding Officer of the RBR, added, “The Governor was very happy to talk to our recruits and asked them how the meals were, why they joined and got a lot of feedback. Col Curley added that, during lunch in the Officers’ Mess, Mr Rankin met civilian guests from HSBC, invited as part of the RBR’s drive to involve the business community in the RBR. Governor John Rankin chats to recruits during drill training at Warwick Camp. He said, “Right now, the recruits have started to perfect some of the dress regulations. We’ve had no issues with discipline and there is a very positive feeling about the whole camp.